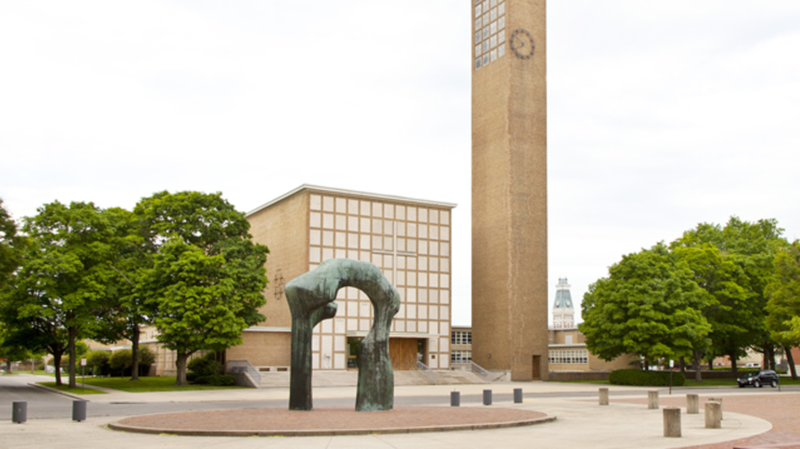 If you want to see architectural gems by world-famous Modernist designers, the 44,000-person city of Columbus, Indiana might be your best bet. The unassuming Midwestern town has an incredible number of buildings by celebrated designers like I.M. Pei and Eero Saarinen, as Co.Design reports. The city has more than 80 buildings, landscapes, and pieces of public art by world-famous architects and artists, with seven buildings classified as National Historic Landmarks, according to Exhibit Columbus, an arts festival designed to showcase the town’s architectural gems. Much of this design heritage is due to the endeavors of Joseph Miller, an industrialist whose family founded the Cummins Corporation, a manufacturer of engines and power generators. In 1954, as chairman of the company, he founded a corporate foundation that has supported public architecture ever since. Miller’s goal was to turn Columbus into a town that could attract the best and brightest employees, starting with making sure that it had beautiful schools. In 1957, the foundation began offering grants to pay for architecture fees associated with buildings schools. Later, the foundation began offering grants for all public buildings. Bartholomew County Public Library (1971). Photo by Hadley Fruits. Asa result, Columbus was able to commission award-winning, world-renowned designers like Robert Venturi and John Rauch, who built a firehouse; Richard Meier, who built an elementary school; and Robert A.M. Stern, who designed a county hospital expansion. (The full list of grant winners is on the Cummins website [PDF].) Other notable mid-century buildings in town were designed by Eliel Saarinen (with furniture by Charles Eames), his son Eero Saarinen, and I.M. Pei. “The influence of architecture with which we are surrounded in our youth affects our lives, our standards, our tastes when we are grown, just as the influence of the parents and teachers with which we are surrounded in our youth affects us as adults,” Miller, who died in 2004, once explained of his passion for good public design. Exhibit Columbus, in its inaugural year, hopes to invigorate interest in great architecture and design in the city by awarding grants to artists to design and install temporary installations inspired by one of the historic buildings in Columbus. All images courtesy Landmark Columbus.